One of the things that I have been pleasantly surprised with over the past couple of years of wargaming is how the standard of tabletop terrain has improved. I always felt that it was the forgotten cousin in tabletop gaming - people spent hours on their lists, months painting their armiesand then next to no time creating the battlefield on which they play. There are a lot of reasons for this improvement IMO. The first is that it was the area of the hobby that needed most improvement. When I first started playing GW games about 16 years ago, you'd go to tournaments and the terrain would be spartan. 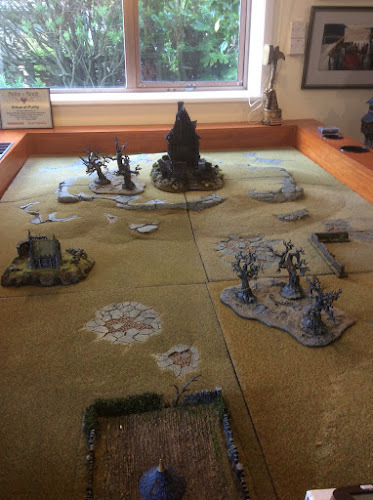 In Australian events it was not uncommon to play 40k on a wooden board with 4 pieces of terrain and Fantasy was little better. Locally, we had more terrain but nothing like today. This impinged on the quality of the game and so TOs needed make more. In a lot of cases this was mass-produced, rudimentary features with an emphasis on function over aesthetics. Secondly, most people tended to play at clubs or local game stores. As a result the pieces used to take a bit of a battering - both on the table and when they were packed up at the end of the day. Over time gamer demographics changed and particularly as they got older (and generally both time and money richer) they invested in their own terrain. As this was an extension of THEIR hobby, the standard and care increased. A lot of gamers have home tables and that incentivises them to build the whole "package". Thirdly, the raw materials, be they terrain kits or hobby supplies, got better. In the past we had flock. Now you have a multitude of supplier who'll sell you static grass, tufts, snow etc. While with kits, we went from a cardboard/foam board buildings to where we now have plastic and resin buildings and trees (more becoming available digitally). Bare tabletops are gone and cloths and static grass mats are now being superseded by themed mousemat battlefields. Coupled with this last point, is the growth of the digital hobby. Over the past few years wargaming has exploded on Facebook, in blogs, on YouTube etc. There are thousands of sources of inspiration and instructions at a click of your mousepad. Tutorials abound and generally the author is readily available to provide further assistance if necessary. THM's Lava Terrain - I purchased it via Kickstarter and it took just over a day to paint! All these things together have helped improve the standard of tabletop terrain exponentially. As a TO, l see part of my role to produce tabletop terrain that is not only functional but enhances the game both visually and in terms of experience. 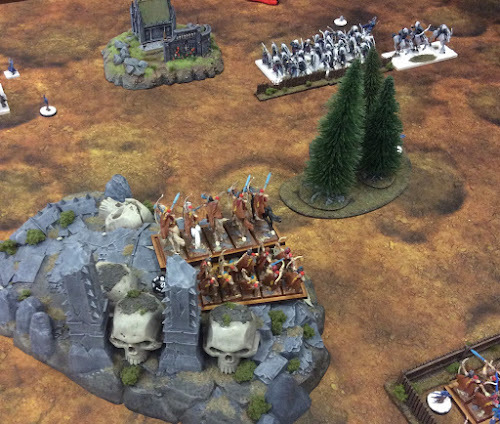 It is immensely rewarding for both players and organisers to have armies battling over an appealing battlefield - and it is the best advertisement for the game/hobby. From the battle reports, blogs, YouTube channels, Facebook photos, the Kings of War community has really embraced this. Tournament organisers are spending time pre-event making terrain to ensure that their event best advertises the hobby. 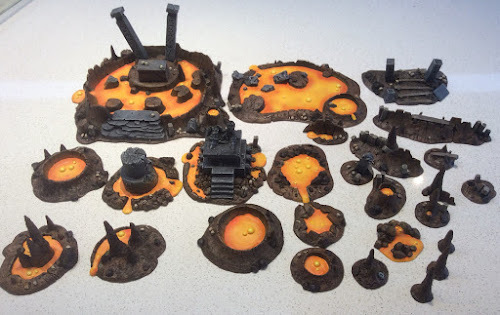 Each day I check out the digital KoW community I see something that gives me new inspiration in my own terrain-making. I can understand why. The nature of our game with blocks of troops that are increasingly multibased are enhanced by giving them an aesthetically pleasing arena. Long may it continue. The availability of affordable, high quality pre-painted laser cut terrain like 4Ground & Plastcraft has also made a big difference. It is easier than ever to make awesome tables with only basic skills and on a reasonable budget.